How many gods are there? Just one. But also several. Okay, I’ll admit: I think I’d be misleading you if I convinced you there was, in any ultimate sense, more than one god. Psalms 95 and 96 have emphasized that there is only one Creator, only one owner of all time and space by right, and in contrast to all the idols and deities of the nations surrounding Israel, he’s the only being truly worthy of the title “God.” But in addition to the usual knocks on idols, such as “Let all those be ashamed who serve graven images,” the author of Psalm 97 makes a peculiar statement: “Worship Him, all you gods” (97:7). And cue the record scratch–the psalmist is calling the gods to worship? You can fit this verse into a “polytheistic deities are just fictional beings invented by the human beings that were invented by the Creator God” hermeneutic. “Worship” here means to bow down, make a gesture of offering yourself. I’m reminded of the time that the Philistines captured the ark of the Covenant (1 Samuel 5:1-4) and placed it in the temple of Dagon, only to find in the morning that the statue of Dagon had toppled down in front of it. Paul, furthermore, seems to lean hard in the direction of monotheism over henotheism when he says, “[T]here is no such thing as an idol in the world, and that there is no God but one,” though he does go on to add, “[E]ven if there are so-called gods…for us there is but one God, the Father” (1 Corinthians 8:4-6). But to come back to the psalm at hand: the psalmist is in fact telling the gods to bow down and worship their ultimate Creator. I think the psalmist’s point is that we live in a spiritual universe. We, beings with souls, have one foot in the immaterial world, which is further populated by angels and demons and who knows what other personal entities–and at the end of the day, all spiritual beings answer to God. I can’t help but think of Dungeons and Dragons, with its ten hojillion fictional pantheons. Imagine what your cleric or paladin would do if they met their patron deity, bowed down before her, and found themselves pulled back to their feet as the goddess says, “No, no, that’s not for me.” Imagine your cleric’s patron deity saying, along with the psalmist, “You are the Lord Most High over all the earth; You are exalted far above all gods” (97:9). It would turn your cleric’s worldview clean on its head. But could such a scenario happen outside of the fictions we write? Are there actual gods inhabiting our space, gods that might worship God himself? Here’s what I think the psalmist means to convey with his references to “the gods.” If, in this universe, you are a being capable of choice, you can either offer yourself to God or fight him. It doesn’t matter how powerful you are, where you fall on the totem pole: you must still choose a response to the Creator of the totem pole. “Righteousness and justice are the foundation of His throne; fire goes before Him and burns up His adversaries round about” (97:2-3), the psalmist says. Do you want the perfect, omnipotent God who rules over our world with righteousness and justice? Or do you want the fire? It’s your call, people. And it’s your call, gods. 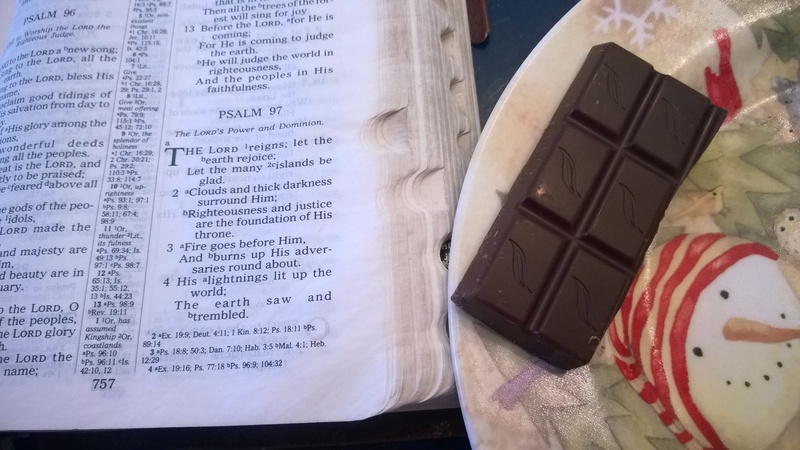 Posted in 1 Corinthians, Daily Reading, Old Testament, Psalms, Samuel.Tagged bible, christianity, Dungeons and Dragons, holiness, omnipotence, polytheism, Psalms, scripture, theology, worship.